I had a chance to mosey on over to Bandai Namco and test out two of its upcoming games; Ni No Kuni 2 (due next month) and Soul Calibur VI (due eventually). In short: boy is Namco in for a good year this year. 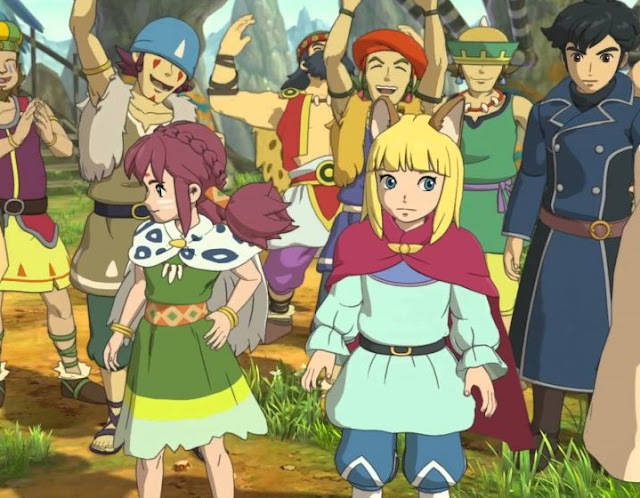 Related reading: Our review of the original Ni No Kuni on the PlayStation 3. The original Ni No Kuni was produced in collaboration with the almighty Studio Ghibli. The sequel is not, but it retains that heritage and sense of magic, and it’s amazing just how far advanced this game looks compared to the original. In terms of art direction, it’s the most beautiful JRPG on the PlayStation 4. I had the opportunity to explore some of the overworld, which gives you a semi top-down, zoomed-out look at the world, and these environments dripped with an eye for detail. For example, I climbed up a hill, and there in front of me was a carefully manicured sandy area, which looked nothing if not like a giant zen garden. This led me to a nearby city, which I soon discovered was based around casinos and gambling, and everyone lives life in the thrall of lady luck. This city was modelled after Asian red light districts, and I was visiting at night, so the rich, decadent, overwhelming colours were melting all around me. It was mesmerising and hypnotic – especially since, in town, the camera shifts from that top-down perspective to a close in behind-the-back perspective, giving you the ability to look all around you. One thing that I was pleased to see is that Ni No Kuni maintains the pseudo Aesop’s Fables approach of its predecessor in the way it constructs its storytelling. Each city offers a small vignette of a story, focused on one particular morality tale. In the case of the demo, the gambling city’s love of leaving everything up to fortune went as far as the judicial system determining guilt on the roll of a dice, and people accepted this as “people with good fortune on their side have nothing to fear.” This, naturally, shocks the group of heroes, and they soon find themselves embroiled in events that will save the city from this way of life going very wrong for the people. 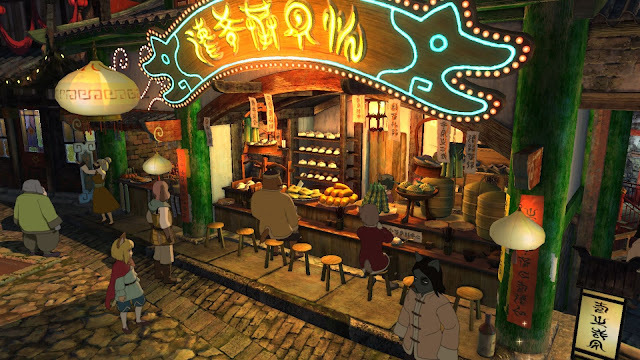 The original Ni No Kuni was so brilliant in structure for the same reason. Within the context of a fairy tale-like world, each town or city represented a different moral problem. The party would solve that problem and then move on to the next town and very different problem. It was a clever way to keep the main plot driving forward while also keeping players engaged through a series of micro-plots, and I am glad to see that come through with this new game as well. The combat might take some time to get used to though. 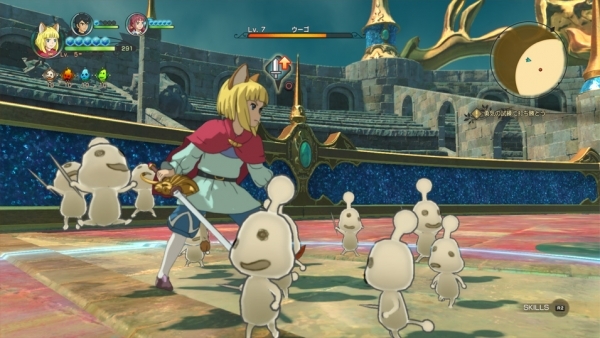 The previous Ni No Kuni was a fairly sedate combat system that played out a little like an action version of Pokemon. It was a delight to actually play, though, as you carefully trained up favourite monsters before putting them forth into battle. The sequel's combat system is more direct, being somewhat closer to something like the Tales of series, and the allied monsters that you’ll pick up along the way providing support to your team. The combat itself feels fine. It’s pacey and fluid, and there tends to be a fair few enemies to square off against each time, and they come from all angles, so the action is nicely dynamic. But it is a substantial departure from the original Ni No Kuni, and anyone who liked that game’s combat system might be a little disappointed here. Still, 2018 has already thrown up a number of really great JRPGs, but I’d have to say that Ni No Kini 2 has the potential to be the best of them. Of course it’s difficult to get a sense of a JRPG from a short play session, but it’s so beautiful, the narrative structure seems to be there, and the combat is something I feel I will warm to. Hopefully people don’t skip over it because, based on everything being released at the moment, 2018 seems to be a year where people are going to skip over an awful lot of really great games.